With a total square footage of 4,302 and a finished square footage of 2,152, the Linden is the perfect rambler home for large households. It comes with a spacious family area that’s located near the kitchen and nook, a separate living room, as well as 3 bedrooms and 2.5 baths. 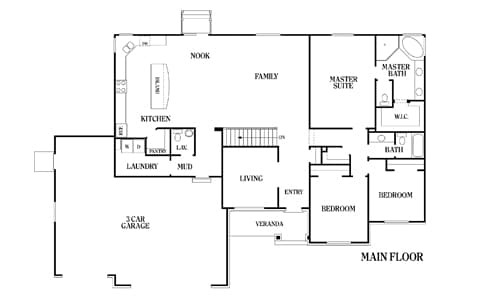 One of the bedrooms is a master suite that features its own master bath and walk-in closet. What’s more, it comes with an expansive garage that can fit 3 cars, as well as a homey veranda in the front. We, at Perry Homes Utah, pride ourselves in constructing excellent rambler and two-story home designs at low cost. Each of our models is thoughtfully designed to ensure that the needs of every type of American household are met. Our company also understands the frustration homeowners encounter when trying to purchase a residential space. As a result, we offer a seamless and stress-free house buying process. Feel free to contact Perry Homes Utah if you’re interested in constructing an affordable yet premium-quality built home in Utah. Our design center personnel will walk you through our collection of rambler and two story style homes, as well as the list of customization options for each model. Furthermore, we offer trustworthy and transparent financing options to help you properly finance your new Perry home. Call us at 801-264-8800 so we can start making your dream home a reality today.